The Whimsie Doodles November challenge is Tag You're It and I wanted to use a few of their wonderful images to make my entry for this challenge. Since it is getting so close to oh... dare I say it, Christmas. Whow, I can't believe we really are already so close to Christmas. It seems I was just outside in the summer sun enjoying the warm weather with my family. So for my project I made a Christmas tree ornament using a silhouette tree die cut. and candy cane elfling images on this project. Check out these images and more at www.whimsiedoodles.com. Love how this came out. So cute! And definitely outside of the box. Dawn, your tree is fantastic!! So glad you are joining us for this month's Whimsie Doodles challenge and putting your name in the hat for a guest artist spot. What a beautiful project! Love the paper piecing! 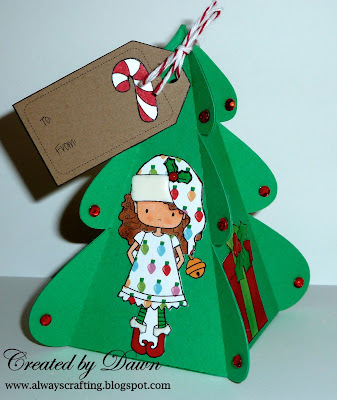 Thanks for playing along in the November Challenge on the Whimsie Doodles blog! 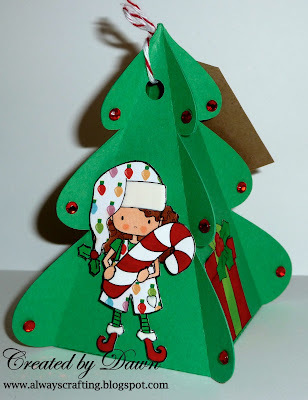 LOVE the idea of a 3-d ornament with a little tag on top. So very cute. So glad you could join us on Whimsie Doodles! Thanks for joining in the fun at Whimsie Doodles Tag challenge!!! Very creative Christmas tree box! I'm so happy that I'm joining your DT at OSCC! ADORABLE! Love how you paper pieced the dress on the Elflings!! So cute! This would also make a great treat box! Thanks for playing along with us at Whimsie Doodles!